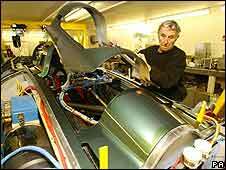 A British-built steam car hoping to smash the longest standing land speed record is to be unveiled in Hampshire. The vehicle, built in the New Forest and due to be tested at Thorney Island, near Portsmouth, aims to beat Fred Marriot's record of 128mph set in 1906. The British Steam Car Challenge team includes test driver Don Wales, 47, nephew of the late Donald Campbell. The Surrey man is also the grandson of Sir Malcolm Campbell. Both men set speed records on land and water. 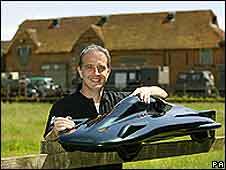 Charles Burnett III, 52, from Lymington, will drive the car during the record attempt in the US later this year. The steam car will be shipped to salt flats at Bonneville in the US next month in preparation for the world record attempt between 25 and 27 August. The team has enjoyed backing from former world land speed record holder Richard Noble. The project aims to achieve 200mph in the steam car, beating Marriott's average of 128mph over a measured mile in his Stanley Steamer. The longest standing land speed record is recognised by the Federation International Automobile (FIA). "It is the team's intention to victoriously claim the world record first at 150mph and then at a later date, 200mph," a spokesman for the project said. The Bluebird K4 was piloted at Coniston Water in 1939 when Sir Malcolm Campbell raised the world water speed record to just over 141 mph. In 1950, his son Donald took the craft to 152 mph. Mr Campbell died while trying to break his own speed record on Coniston Water, Cumbria, in 1967. The vessel suffered a structural failure and sank. After salvage it was stripped and burned. In March 2004, the wreckage of the tragic K7 Bluebird was sold to the Ruskin Museum in Coniston for just £1. It was raised from the bottom of Coniston Water in March 2001, where it had been for 34 years.